All locations except Ohio and Wisconsin: Join us every Wednesday for a FREE Slice of Pie* with any menu item purchase from 10:30 a.m. until close! *Free Pie Wednesday disclaimer for all locations except those in Ohio and Wisconsin: Free slice of pie with the purchase of any menu item. No coupon necessary. 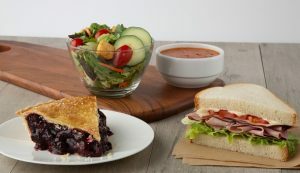 Beverages, side items and pie slices do not qualify as a Free Pie Wednesday™ menu items. Dine-in only. Available from 10:30 a.m. until close. Limited time only. May not apply to all pie varieties and excludes Specialty Desserts, such as Caramel Apple Pie à la Mode, Brownie à la Mode, Cheesecake and Carrot Cake. Excludes Pie Shop Special and Bakers Bundle®. One slice per person per purchase per visit. Valid only at participating restaurants. Not valid with other offers, promotions, discounts or coupons. Tax and gratuity not included. Promotion subject to change. See restaurant for details. For locations in Ohio and Wisconsin: Join us every Wednesday for a FREE Slice of Pie* with any entrée and a beverage purchase from 10:30 a.m. until close! 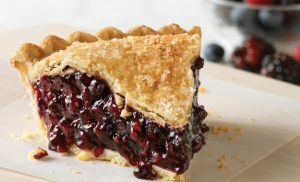 *For Ohio and Wisconsin locations: Free slice of pie with the purchase of any entrée and a beverage. No coupon necessary. Side items and pie slices do not qualify as an entrée. Dine-in only. Available from 10:30 a.m. until close. Limited time only. May not apply to all pie varieties and excludes Specialty Desserts, such as Caramel Apple Pie à la Mode, Brownie à la Mode, Cheesecake and Carrot Cake. Excludes Pie Shop Special and Bakers Bundle®. One slice per person per purchase per visit. Valid only at participating restaurants. Not valid with other offers, promotions, discounts or coupons. Tax and gratuity not included. Promotion subject to change. See restaurant for details.